Discussion in 'Computers, Science & Technology' started by UberScout, Mar 23, 2019. "Skippy became too weak from hunger and died of starvation. He was fourteen years old.". Upon clicking the "OK" button, a jarring, blaring funeral dirge blasted itself out of my computer's speakers while Skippy disappeared from my desktop, the words "No Pet" appearing underneath where Skippy was. I had to stop for a minute. That was deep for something written in Visual Basic. My sister and I found an Amiga game called Germ Crazy, basically its a blend of real time strategy and medical simulation, where you put antibodies in some poor guys body to help fight off a flesh eating disease. Over time the virus spreads and eats away at the guys innards, eventually disintegrating his limbs. You have to regularly feed him and let him sleep, and if desperate you have the option of buying drugs off the black market(! ), amputation and prosthetic limbs or just life support. I remember one session going particularly bad; the guy's left foot and leg were nothing but bones, and his liver was completely decayed and I had only 132 in game dollars left (buying antibodies cost money). I was told to eventually go with my mother to get groceries and forgot to pause the game (the emulator I was using didn't seem to have a pause function, at least I couldn't find one). When I had gotten back, I re-maximized the game to find a skeleton behind a tombstone, arms spread out with the guy's face to the right, looking like he was sleeping. (The game puts his face on the control panel to show you whether he's in pain or stressed out) Brrr. I still remember the first screamer/jumpscare I got on YouTube, it was from watching a video of that really dumb commercial for The Legend of Zelda for the NES I remember seeing on TV. It had two dorky guys playing the game while this rap song goes, "It's the Legend of Zelda and it's really rad/Those creatures of Ganon are really bad". Then they replay the commercial and the rap backwards, claiming there was some kind of subliminal message in it. And then suddenly there's a horrible scream while gory images flashed on the screen. Afterwards I was laughing and giggling hysterically as I switched on every light in my apartment. Play Candy Crush for goodness sake. You eat candy and blow up candy and stuff. Much more relaxing than watching people die. I like the idea of trying to save something in a video game much more than the idea of trying to kill something. What was it about those games that you found appealing? You're in the living room, of a house you're not too familiar with (though the main character lives there) . You just finished a battle against something evil, something that should never have been there... an entity that could somehow dive in and out of a TV through a game you had rented. 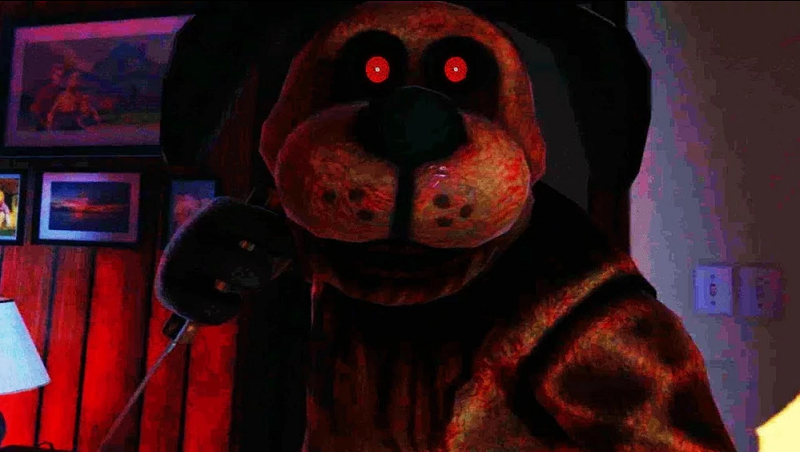 This "character", a dog, it turns out is responsible for more than a few murders of other entire families around the neighborhood, and the protagonist's mom is the most recent one (as in, she's still lying there in the nearby kitchen, and it's pretty brutal). After being pulled in to confront the dog in his world, you manage to stop him... barely. It was already a tense situation, as had you lost, you would have been trapped in that place forever, with him permanently freed, able to roam the real world at will and do who knows what. This is all in virtual reality, mind you, on a hyper-expensive computer built to max out everything all the time. So when I say he's "right there", that's EXACTLY what it's like. You dont just spin around 180-degrees by moving a control stick... you physically turn around, as you're standing this whole time. And then this huge character seems to be, to your eyes, physically standing right behind you. Horror games are one thing. It turns out that horror games in VR are a whole seperate beast. I've had more than a few "NOPE, screw this, I'm out" moments while playing some horror-ish things on there (whereas normal, non-VR horror games, I can handle anything). There's some games that I'd like to try at some point but frankly am not ready for. The screenshot there, needless to say, doesnt do it justice... it's impossible to show a VR game properly in a 2D screenshot. Seriously, it cant be done. Nor can a video show it. VR (when done right) looks as real to you as the room you're right now sitting in, to the point where alot of really bizarre side effects can happen (many of them absolutely hilarious, like someone trying to sit down on a chair that doesnt exist. Bonus points if the chair looks like a cartoon chair). No seriously, there's all sorts of really funny videos of stuff like that... go check some of them out. My favorite is if you get someone trying to walk/run through a doorway that doesnt exist... right into a wall that DOES. I could watch people do that one all day. Also someone seems to have applied a bit of a filter to that screenshot, I dont know why, though it does look kinda cool. I thought we were talking about scary things on the computer in general, not just video games. I was wrong, as usual. If you want other scary things, I can provide, easily. I tend to be drawn towards creepy stuff. No, I dont know why. But the internet provides all sorts of things. Some a bit more intense than others. That's a recent favorite of mine. There are many others, but that's the first one to pop into my head. I definitely appreciate the amount of work that must have gone into making it... that stuff aint easy to do! It's from the same creator, but this one is a bit slower and more subtle in what it does. It continues to get more and more unsettling as it goes on. Another great one is a series called "Dont Hug Me, I'm Scared" which is easily my favorite series on Youtube. I thought it was brilliantly done, although short. That one though... not for everyone. I loved it, but there's a few specific moments that might be a bit too intense for some viewers. I wont post the link here directly, because it's super easy to find via Youtube's search. It's been massively popular. There are 6 episodes. To anyone that decides to check it out, be sure to watch them in order. Of all of the creepy stuff I've seen on Youtube... which is alot... this is by far my favorite, period. And there's more to it than just that one video... the rabbit hole goes DEEP with this one. There's no jumpscares or anything here... this video will use a very different approach than what many people consider to be traditional "horror". There is one very, very specific moment that I thought was really freaking scary, but that occurs seperately from this video and takes some real digging to find. But this, the main video for the experience, is the best. There's also plenty of photos I could show. Half of which seem to be of creepy dolls... that seems to be a running theme for me. And then there's... others. Certain specific photos are TOO intense, I wouldnt dare post them here, as I'd rather prefer triggering an intense reaction in any of the users here. ....Also I'd have to dig through the hideous mess that is the photos collection on my PC here to get at those specific ones. For those that like horror, scary stuff, creepy things, or just unsettling and weird imagery... there's no shortage of it! Of course, ALL of this is subjective. Some people might find any given thing to be just horrifying... others might find the very same thing to not be scary at all. Something like 15 years ago I read an illustrated story about going into a cave called "The Fear Of Darkness". It seemed like they were descending further and further toward hell, and there was a picture with a rock that looked like it had eyes on it looking back at you.